Yes you’ve read right! 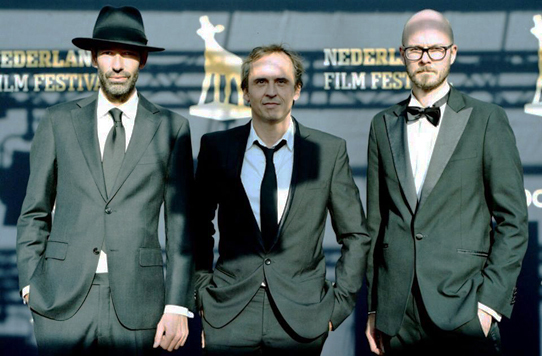 This year's Dutch Golden Calf (Gouden Kalf) for best short film (beste Korte Film) goes to Rob’s DAS WAD. In this amazingly funny silent short an old jewish detectorists (Rene van ‘t Hof) heads out to the Dutch North Sea shallows (het Wad) in order to look for some serious booty. However, after he stumbles upon an second world war submarine filled with old nazis, he gets more than he’s bargained for. Besides being very funny, the film is also a little masterpiece of visual composition. The wide shots of endless sand create an amazing western like feeling and clearly show how beautiful and rugged Holland’s nature can be. Remus completes this graphical enormousness with a beautifully playful score. As alway Remus has managed to create a very classical sound which still comes across as highly up to date. This time the music touches Klezmer in a pleasant way, with a cherry on top in the form of Paul van der Feen’s superb klarinet parts. Now if all this hasn’t convinced you to go see this flick, here’s the trailer. Enjoy!